1. There is no 3-second count between the release of a shot and the control of a rebound, at which time a new count starts. This is any shot attempt regardless if the ball hits the rim. 2. A player who is not a dribbler in control can keep (tap) a ball inbounds, go out of bounds, and return inbounds and play the ball. Player has to establish himself back inbounds prior to touching the ball. 3. There is no such thing as "over the back". There must be contact resulting in advantage/disadvantage. A player should not be penalized merely for being taller or having the ability to jump higher than their opponent. 4. "Reaching" is not a foul. There must be contact and the player with the ball must have been placed at a disadvantage. 5. A player may always recover his/her fumbled ball; a fumble is not a dribble, and any steps taken during recovery are not traveling, regardless of progress made and/or advantage gained. Running while fumbling the ball is not traveling. 6. It is not possible for a player to travel while dribbling. 7. 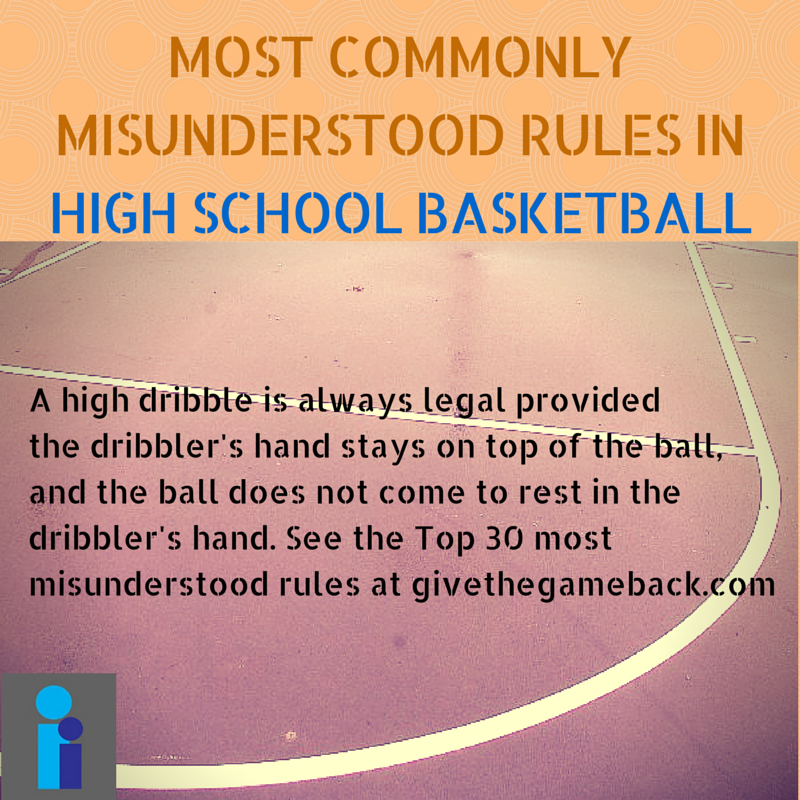 A high dribble is always legal provided the dribbler's hand stays on top of the ball, and the ball does not come to rest in the dribbler's hand. 8. A "kicked ball" must be ruled intentional to be ruled a violation. Just because the ball contacts a players foot/leg doesn't automatically mean it is a kicked ball. 9. It is legal for a player to rebound/catch his or her own air ball, provided the official deems the shot to be a legitimate try and not a pass. This one would be near the top of the list for most misunderstood. 10. If the ball is lodged on or in the support of the rim, a jump ball is awarded. If it happens during a free throw attempt or throw-in, then it is a violation. 11. Striking the ball handler or shooter on the hand, while holding the ball, is not a foul -- no matter how noisy or how much it hurts.The hand is part of the ball. 12. A defender does not have to "give the dribbler a step" as long as legal guarding position has been obtained and then it is up to the dribbler to avoid contact. The person with the ball should expect to be guarded. 13. The sides, top and bottom of a rectangular backboard are IN BOUNDS. The back of the backboard is out of bounds. If the ball travels over the backboard, it is out of bounds. 14. Jumpers may tap the ball simultaneously; may tap the ball twice and when the legally tapped ball touches the floor, the jumper may recover the ball. 15. A 10-second backcourt count continues even when the defense deflects or bats the ball. The count stops when "team control" changes (the offense maintains team control during a loose ball). 16. A "moving screen" is not a foul unless there is contact. If contact occurs, it is a blocking foul. 17. Any contact foul during a live ball must be ruled a personal foul. The contact can be intentional or flagrant, but not a technical. 18. Any unsportsmanlike conduct during a dead ball must be ruled a technical foul. 19. Basketball is a contact sport. Incidental contact often occurs and contact which does not create an advantage/disadvantage situation may be ignored. However, contact on the shooter should be called. 20. 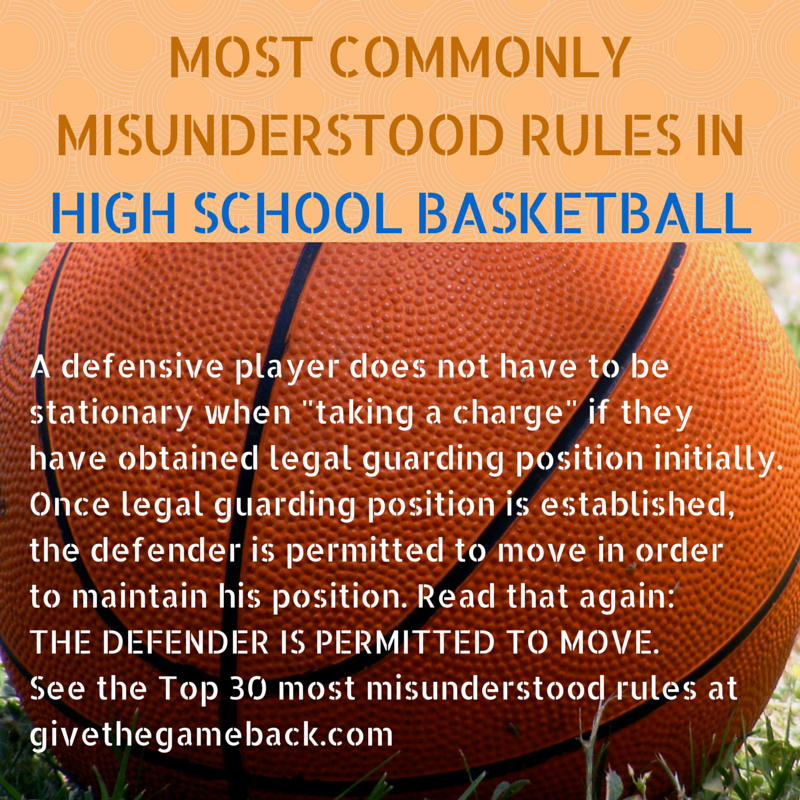 A defensive player does not have to be stationary when "taking a charge" if they have obtained legal guarding position initially. Once legal guarding position is established, the defender is permitted to move in order to maintain his position. Read that again: THE DEFENDER IS PERMITTED TO MOVE. He can even be completely airborne and still draw a charge. Legal guarding position is established by having both feet on the floor and the body facing the ball handler. The defender can jump vertically and draw a charge as long as the defender is not moving forward during the jump. If so, then the defender is initiating contact which is then a blocking foul. A good way to differentiate between a block and a charge is where the contact occurs. Typically if contact is on the chest, it is a charge, if iit is on the hip or shoulder, it should be called a block. 21. An intentional foul is always penalized with two free throws, except on a missed 3-point attempt, which is awarded three free throws. The ball is then awarded at the spot closest the foul (not automatically at half court). 22. When an airborne shooter commits a player control foul (charging), the successful goal is disallowed, regardless of whether the try was released before or after the foul. 23. Lifting the pivot foot does not constitute a travel unless the ball handler places the pivot foot back on the floor prior to beginning a dribble, passing or shooting the ball. 24. Basketball interference occurs when: a player touches the ball or basket (net included) when the ball is on or within the basket; touches the ball when it is touching the cylinder having the ring as its lower base; touching the ball outside the cylinder while reaching through the basket from below. 25. Goal tending occurs when: a player touches the ball during a try or tap while on its downward flight entirely above the basket ring level and has a chance of entering the basket in flight or an opponent of the free throw shooter touches the ball outside the cylinder during a free throw attempt. In high school, the downward flight rule still applies if the ball touches the backboard first. Meaning, a player can legally block a shot after the ball hits the backboard provided the ball has not started moving downward toward the cylinder. 26. It is impossible to travel while taking the ball out for a dead ball throw in. The thrower must stay over the designated spot that is 3 feet wide and has no restrictions on depth. 27. Backcourt violations are complicated and difficult for fans to grasp. The half court line is considered part of the backcourt. In order to draw an "over and back" call, the offensive player must fully establish themselves in the front court first. Establishing position in the front court requires three points of contact with the floor, which means both feet and the ball. Once all three points make contact with the front court, any one of those points that touches the half-court line or any point behind it then justifies a violation. 28. Another backcourt scenario that is often misunderstood relates to team control. Follow me on this scenario....A player from Team A (A1) passes the ball to a teammate (A2) in the frontcourt, and the ball is tipped by a player from Team B (B1) towards the backcourt. Before the ball gets to the backcourt it deflects off player A2 in the frontcourt. A2 then recovers the ball in the backcourt.This is a backcourt violation even though the ball was tipped. Because Team A still maintains team control during a loose ball and was last to touch the ball in the frontcourt, it is an over and back violation. Had the ball tipped A1 in the backcourt, there would not have been a violation. 29. Closely guarded five second call. A player can legally be in possession of the ball while being closely guarded for 12 seconds. How? A player who catches the ball and is being closely guarded may hold the ball for four seconds, then dribble the ball for four seconds and then hold the ball for another four seconds before passing or shooting the ball and not be in violation. A violation occurs when the ball handler is closely guarded (within six feet) by the any defensive player for five consecutive seconds while the ball is being held or dribbled. This violation can only occur in the front court and the count stops when the ball handler gets his/her head and shoulders ahead of the defender. 30. Sliding on the floor with the ball is not a travel. 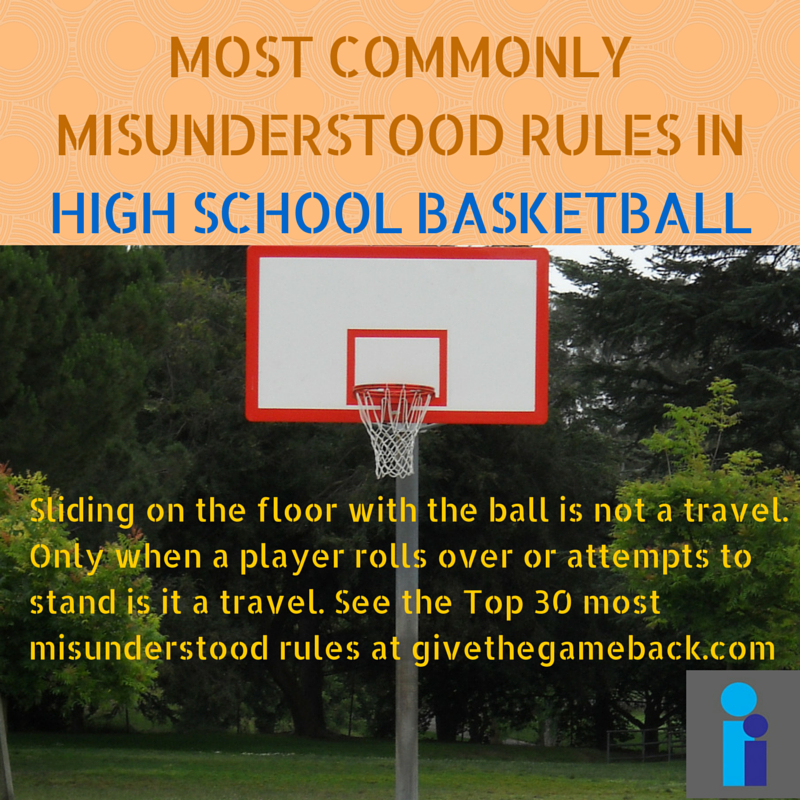 Only when a player rolls over or attempts to stand is it a travel.